Industrial diamond for dressing grinding wheels. 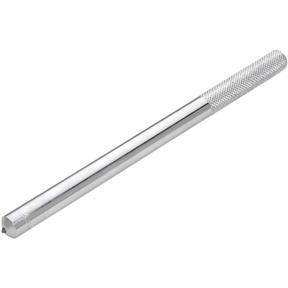 8-1/4" long round body with knurled grip for maximum control. Includes protective rubber end cap. I haven't used the dresser yet. I am new to the use of low speed grinder sharpening systems and recently acquired a T10010. I read the manual for the sharpener carefully and saw where it encouraged the use of a dressing tool for optimum sharpener performance. There was no instructions on dressing the grinding wheel in the manual as it referred the user to the instructions that came with the dressing tool. So, I was disappointed to find that my new diamond dresser didn't include any instructions on how to go about using the dressing tool. I think I can figure out how to use it, but am going to try to find other sources of instruction before I use it on my wheel. This 3/4 carat Diamond Dresser is built to last with its perfectly tapered stone, properly embedded on a hefty plated knurled handle. You can expect to pay over 5 times the price for lesser quality product elsewhere. And it's shipped for your receipt in a couple of days, when in stock. And these are always in stock! If you see one cheaper online, it won't be "similar" and you'll have to wait weeks for delivery from China! I purchased this Diamond Dresser 3/4 Carat for my husband and he loves it! I bought this diamond dresser a few weeks ago and it is an excellent tool and the price was less than anyone else. I am a wood turner and I try to keep my grinding wheels true and flat this tool does a good job.